Reputedly named after a one-time local landowner in the Rossinver area, Fowley's Falls must be one of the best kept secrets of North Leitrim. As the Glenanniff river travels down from the mountain above, it has eroded the local blue limestone to form a deep river valley. 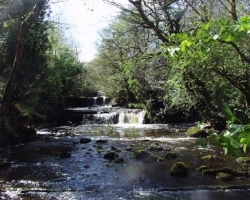 Unlike the more popular Glencar waterfall, also in North Leitrim, Fowley's Falls is not a single-drop waterfall. Instead it cascades in a series of drops over the exposed bedrock to form a spectacular torrent of water rushing through the steep valley towards Lough Melvin. In penal times locals gathered at the Mass Rock further down the river and over the years many poachers enjoyed fish caught close by. 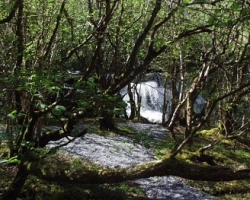 It was in the early 1980's that Gabriel Miney, an engineer for Leitrim County Council, in conjunction with the local parish priest, Father Corrigan, organised a scheme to clear a path and make the falls accessible to walkers and anyone simply wishing to enjoy the beauty of the countryside. Their vision was to keep the walk as natural as possible with narrow gravel paths, stiles made from stone drawn from the riverbed and minimum interference to the natural ecosystem. Rather than cutting back the hedgerows to give full views, they cut windows at various stages or stopping points in the walk, where the walker could take in the best view of the river. With assistance from local businessman, Philip Rooney, a bridge was also erected over a tributary to the river. Many of the local residents still recall the duck race organised by Fr. Corrigan as a fundraiser that brought the whole community out, young and old, for a fun day at Fowley's Falls. Unfortunately, after the scheme ended the walkway and the bridge gradually fell into a state of disrepair. In 2003 Rossinver Community Development Company (RCDC) decided to restore the walk in keeping with the original vision - and also to extend it. RCDC applied to both, Arigna Leader for a Rural Social Scheme and to CLÁR, for funding to improve the parking and roadside pathway, thus making the access to the entrance from the public road safer. Coillte, the state forestry board, and the other owners of the surrounding land were approached and were fully supportive throughout. The extension to the walk is now complete and can be accessed near the Organic Centre. The total length of the walk is around one and three-quarter miles (around 3 kilometers). Visitors should be aware that it is not a circular walk.